Atlanta, Georgia, is a city mixed with culture and industry. This rising U.S. super-city serves as a major transportation and business hub, while presenting a growing arts and cultural community. “The City in a Forest,” Atlanta’s abundant trees and natural streetscapes complement its progressive and modern architecture and offerings. During your Atlanta vacation, explore the High Museum of Art and the city’s other major artistic institutions, check out bohemian shops, sample diverse dining, or pay homage at the Martin Luther King, Jr. National Historic Site. Atlanta’s sophisticated music and arts scene blends nicely with laid-back Southern hospitality and specialties. 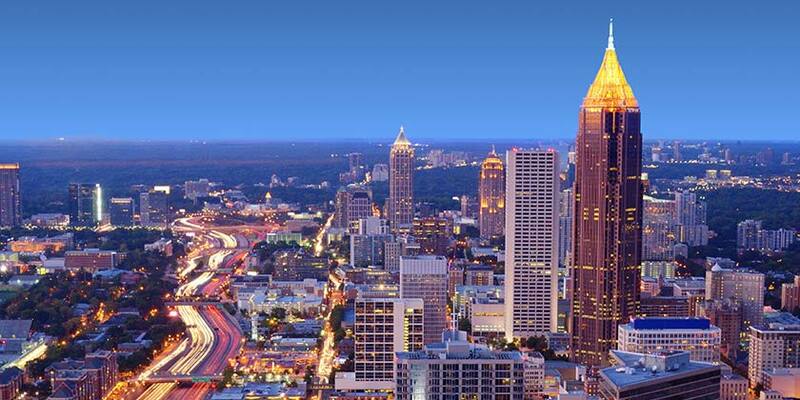 Atlanta's most famous attractions at one amazing low price with plenty of time to take advantage of the savings. Take a whirlwind bus tour of top Atlanta attractions including Georgia Aquarium, World of Coca-Cola and Turner Field on this half-day tour. Resort info: Smartly appointed suites offer a large living area, full kitchen with a fridge, range, oven and microwave. Unwind in the pool or on the Sport Court®. Resort info: Guest rooms feature contemporary decor with stylish furnishings including Hyatt Grand beds, flat panel TV, sofa-sleeper, wet bar and granite vanity. Resort info: With its soaring 22-story atrium lobby and its famous blue dome, this has been a landmark in Atlanta for over 40 years. Resort info: Our beautifully appointed guest rooms feature Hyatt Grand beds, flat panel TV, sofa-sleeper and granite countertops. Resort info: Escape the busy streets of downtown and relax during your trip to Georgia. Sophisticated shopping, museums and family fun await our hotel's guests. Resort info: This distinctive hotel combines classic elegance and unsurpassed service to offer discerning guests Atlanta's legendary hospitality.